While I wasn't able to make it to MAX this year, I did follow Serge Jespers and Andrew Shorten's live blogging of the keynotes and the sneak peek session. 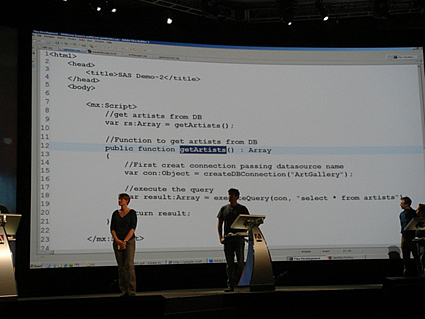 Lots of amazing sneaks revealed tonight, but by far the best announcement for developers (in my opinion) was ActionScript 3 as a server-side language. I had actually blogged about how I wish this would be released back in July, 2007. From what I read in the live blog, it allows you to write ActionScript 3 which runs on the server by defining a .sas file containing your AS3 code. In the same file you can also define code to run both on the server and in the client by setting a runat variable: runat="client" for client side code and runat="server" for server-side code. As you can see in the photo above, pulled from the live blog feed, you can run ActionScript code on the server from within your normal client-side application code. If you can't quite make it out, the photo is showing MXML in Flex Builder. 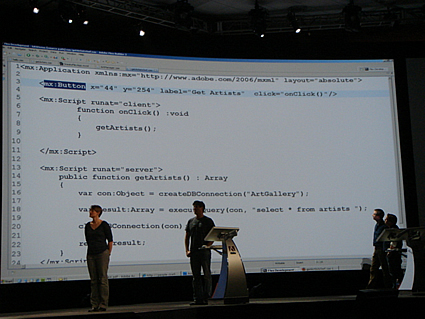 And in this photo you can see how ActionScript can be embedded within HTML, just like PHP, etc. Notice how both client and server-side code allow calls directly to databases with an executeQuery() function, passing in an SQL statement. I'm eager to hear more about this, but from what I can gather, unfortunately not much else was mentioned at the sneak peek session. Nothing on Adobe Labs yet, either. As more details become available, I will certainly be sure to blog about them. Update: Looks like it is coming with the next release of ColdFusion server, codenamed Centaur, which makes a lot of sense. Some additional details can be found over at this blog post. Is there a runAt=”both” option? @John – Very few details have emerged about this project, and all I have seen is what was announced last night. With that in mind, I haven’t seen that option mentioned, but that doesn’t mean it does not exist. I suppose you could always call the same function from both “client” and “server” script tags. Yes, i’ve been there in Milan. That is so cool. A professional solution for server-side AS3. But an open-source version it’s also a must, as long as the AVM, Tamarin is open-source. People will start with free versions and later on, if needed, will move to more powerful solutions, like the one from mighty Adobe.